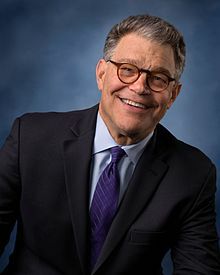 Alan Stuart "Al" Franken (born Mey 21, 1951) is an American writer, comedian, actor, producer, an Democratic politeecian wha servit as the junior Unitit States Senator frae Minnesota frae 2009, takkin affice 6 months later than planned acause o an election recoont. He offeecially demittit on 2 Januar 2018 amid accusations o sexual harassment. ↑ Franken wis electit tae the term beginnin Januar 3, 2009, but did nae tak his seat till Julie 7, 2009, acause o a recoont an a subsequent election challenge. This page wis last eeditit on 22 Mey 2018, at 17:49.